TheLEADERNovaland Group has signed a partnership with Greg Norman Golf Course Design to develop four golf courses under the Greg Norman brand within the framework of the 2018 Viet Nam Travel and Tourism Summit held in Hanoi yesterday. 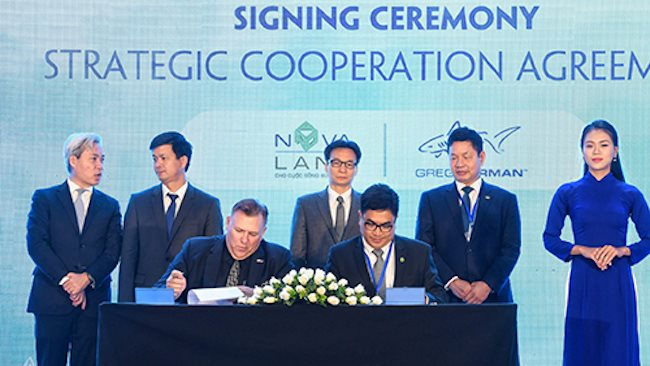 Under the agreement, Novaland Group will develop four Greg Norman golf courses in Can Tho, Ba Ria - Vung Tau, Phan Thiet (Binh Thuan) with the total investment value of $100 million. The first golf course designed by golf legendary Greg Norman will be launched in Phan Thiet in the first quarter of 2019. According to a representative of Novaland Group, this is a new step to help the localities to develop the image of destinations associated with the high-end customers who are golfers coming from all over the world. Daniel Grassi, a representative of Greg Norman Golf Course Design states that Greg Norman chose to cooperate with Novaland Group as the latter is one of the largest real estate corporations in Vietnam. The company has also proved its motivation and passion for tourism development in the country and in the region. He also highlights the potential of golf tourism in Vietnam. The golf tourism market currently occupies only 0.5 per cent of the total number of international tourists. With this cooperation, the two sides expect this number would double next year. At the 2018 Viet Nam Travel and Tourism Summit, Novaland also signed a cooperation agreement with Minor Hotels Group in managing the operation of seven resort hotels with more than 3,500 rooms. Accordingly, Minor Hotels Group will manage seven resorts developed by Novaland in Ho Chi Minh City, Vung Tau, Phan Thiet, Cam Ranh. According to Chief Executive Officer of Minor Hotels Group Dillip Rajakarier, Vietnam has a great potential for attracting local and international tourists with stunning sceneries, and cultural specialties. "The partnership with Novaland will create a special product for the customers of Minor's Avani brand," said Dillip Rajakarier.